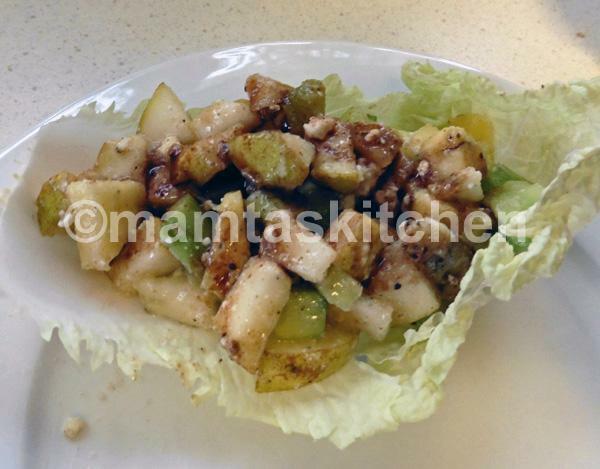 This is one of the easiest, healthy snack that you can serve as an afternoon snack or as a starter. 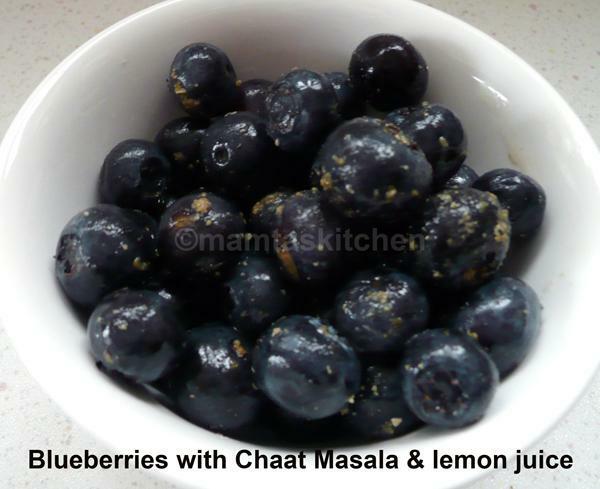 Make it using any seasonal fruits, a single type or mixed fruits. I sometimes serve it as a side dish in a buffet, especially in summers. In India, it is quite common to eat fresh, seasonal fruits this way. It is often sold by street hawkers and little 'juice' stalls, it is very popular. Select approximately 1 portion of fruit per person. Any fruit combinations of choice such as apple, pear, pomegranate, firm banana, pineapple, peach, pear, guava. Berries can be added, such as blueberries, strawberries, raspberries. Salt to taste (chaat masala already has some salt). Use kala namak (black salt) if you have it. It gives a better flavour to chaats. Wash cut/prepare fruits into bite size pieces. Pomegranate kernels/pearls need to be separated from the bitter membranes. If adding bananas, add them last, or they get crushed during stirring. 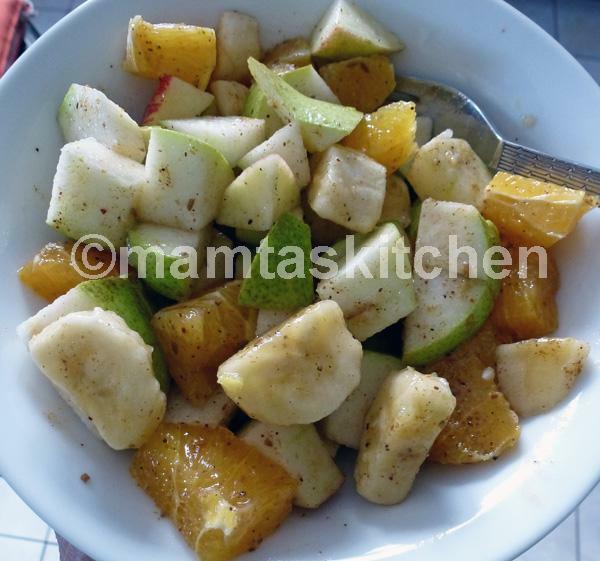 Place all fruit in a bowl and mix with chat masala, lime juice and salt. Adjust seasoning, chat masala and lemon juice to taste. Serve fresh. It is quite nice served with tandoori prawns/fish/chicken etc. 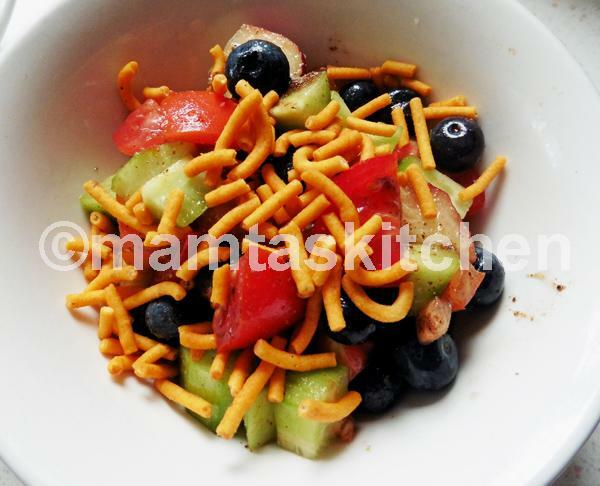 To spice it up a little more and to add crunch, sprinkle a handful of besan-sev or other similar Indian snack mix on top. These are usually bought ready-made these days, but you can attempt to make your own, if you have a vermicelli maker. *Most people use ready-made Chat Masala and Besan Sev these days, which can be bought from all Indian grocers.